It has taken alot of time, but we are back! It is an entire new format, with articles containing useful information to documents that hold evidentiary value related to our articles. While this is still a work in progress, we wanted to get it up and running so please bear with us as we continue to add things everyday. So who and what is Dailyrollcall.com? Dailyrollcall was founded in 2012 by retired Albany NY Police Officer Cathy Hinners. 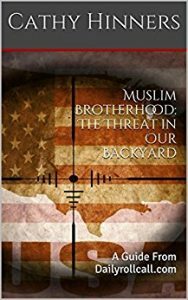 Upon relocating to Tennessee, Cathy became active in exposing who and where the Muslim Brotherhood was, and how they were infiltrating and indoctrinating our schools, military, law enforcement and even our own government. In 2014, Cathy was joined by other retired police and military officers to help vet and investigate information from the public, concerned about the Islamists and their organizations . Cathys experience was used to develop and deliver a 3 day course to law enforcement across the country as well as conducting mobile training as a U.S Dept of Homeland Security subcontractor. Her time with SAIC was instructing members of the NYPD and National Guard on how to handle incidents of terrorist threats, specifically WMD and bomb recognition. Cathy continues to expose and investigate the individuals and their groups on several talk radio stations including the Michael Delgiorno Show, on 99.7 WTN Nashvilles Supertalk. ← Previous Previous post: Psst..Ohio State University It’s Called Jihad!